As the picture depicts – the last couple of days have been quite the roller coaster ride. Mainly in physical responses to juicing, from excellent energy to sluggishness and an upset stomach, to disinterest in the juices themselves. None the less I shall persevere and overcome. I trust that by riding the waves, moving through any detox symptoms and continuing to adhere more completely to a schedule things will all work themselves out. Patience certainly is a virtue – one that I wasn’t necessarily born with, but one that I am and have been learning and practicing. I like to think of every mental, emotional or physical challenge, a muscle that is getting built over time. Work on it day by day and soon that area will be nice and toned. One thing is very clear, sleep is so, so important especially when cleansing. Although I have had days where I could sleep small amounts and wake up to feel energized and continue strong throughout the day, for the most part the past few days when I definitely haven’t gotten adequate sleep I feel horrible the next day. A sense of anxiety that I don’t normally have kicks in, detox reactions are more likely, less joy in general. My take on it, sleep, sleep ,sleep. Not to over do it, but at least to get your personal necessary sleep. Then if one would wake up after 4, 5, or 6 hours of sleep naturally – that’s the bodies natural signal for having received plenty of rest. So, tonight I will keep it short, get to bed before 11pm and wake up whenever my body tells me its time to wake up. I mean, an important part of this juice feast is to set in excellent habits, and in two days I’m a month in. That means only two months to go, I think now is a great time to jump on the ball and get rolling with good stuff. The roller coaster above very well may be attributed to my recent sleeping patterns. I watched a very important documentary about the state an a brief history of food GM and Non GM in the country and the worlds response to it (Go Thailand, Mexico and UK!). It’s a movie I think everyone who EATS should definitely rent, watch and share with friends and family if you haven’t already. 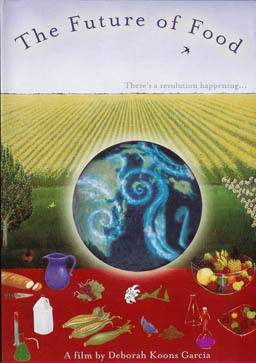 The name of the film is “The Future of Food”. The above pic is linked to their website to find out more. Tomorrow comes another day of cheffing all day, let’s see how it goes this week??? I think it will go well. Although the food looks, smells, and feels so good – definitely making my mouth water, I feel at peace with the process and it actually is such a creative outlet for me that the days flow more quickly smoothly and I have less time to think about the juices and the time etc. When I get hungry I drink, then I continue. Or so has been the experience in the recent past we will see what tomorrow may bring. Not much more to report on right now. My body is feeling stronger as I’ve been saying and as many know – in general when you begin any exercise regime, at first it may seem like you have to push yourself, but soon, when the results (even sore muscles and such) begin to show up an excitement to go further starts to naturally and effortlessly drive you to go further. That’s what I’ve been feeling, like I want to exercise, I want that push, I want to see muscles form, fat dissipate and witness my body become an even more (much more) efficient vehicle.